In last month's "Robotics Resources," we talked about "thinking outside the box," finding construction materials that — at first glance — don't look like suitable robot building parts. Whether it's a toy, a sewing accessory, or a piece of hardware designed for use in shelving, you could discover a great new use for something simply by looking beyond its intended use. Last month, we began with a look at out-of-the-ordinary materials, including transfer films, store fixtures (one of my favorites), paper and plastic laminates, jewelry "findings," woodcraft materials, restaurant supplies, and science goodies. In this month's column, we'll look at more retailers that carry merchandise which can be pressed into service for building bots. These retailers include sporting goods stores, arts and crafts outlets, office supply stores, and more. Scan their product offerings for ideas. Obviously, this list doesn't represent every place that sells something useful for robotics. The idea here is to get you thinking outside the box! • Packing tape, non-permanent adhesives, reinforced strapping tape, double-sided tapes. Adhesive tape can be used to attach small parts to your robot and is also useful for "temporary" constructions. Double-sided foam tape is particularly handy for mounting R/C servos and even small caster wheels. Reinforced strapping tape is very strong, yet lightweight, and can be used to hold motors and other parts to a frame while you experiment with different designs. • Inkjet transfer film. Use the film to make designs for your robot. Print the design on the film, then transfer the artwork to the robot (the film package provides instructions). • Plastic for spiral binding machines The plastic covers are thin and pliable and great for the outer skin of your bot. The plastic combs can be used for wire management (keeping all the wires together), bumpers, and more. • Magnetic sign sheets. These are basically magnets in sheet form. 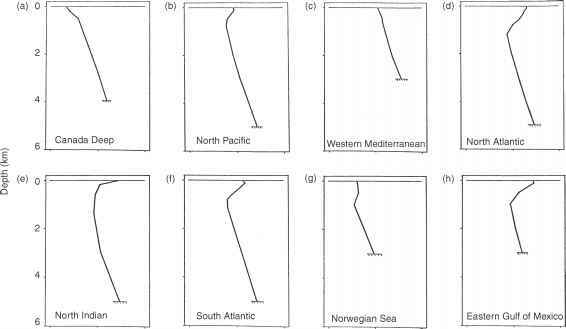 You can cut out shapes with a knife or scissors. I've had success cutting out little 1/4" discs and then mounting them on the side of a wheel. By using a Hall Effect sensor (sensitive to magnetic fields), it's possible to count the revolutions of the wheel. These chain store listings are representative of office supply stores worldwide. These resources offer online sales and you can browse their web catalogs for ideas. Office supplies is the name of the game at Office Depot — the largest office supply biz in the world. Shop in both their online store and their many brick-and-mortar retail stores across the US. Office supplies. Examples of the kind of stuff you need: batteries, drafting and design, labels and label makers, storage and organization, tape, adhesives, and glues. Local stores and online mail order. Staples operates a couple (okay, some 1,300) of office supply stores in the US, Canada, Germany, the UK, the Netherlands, and Portugal. They also sell most of their products online from their website and through direct catalog sales. Refer to the website for a store locator. display boxes (use as parts containers or cheap electronics housings), polymer clay, casting materials, and more! Be sure to check out the store's selection of foam board, which is made by sandwiching a piece of foam between two sheets of thick paper. Most foam board you'll find in arts and crafts stores is 1/4" thick and available in colors. Use a knife or small jigsaw blade to cut it. You can use pieces of foam board to make down-and-dirty robot platforms. For a small and lightweight robot, you don't need heavy wood, metal, or plastic. Arts and crafts supplies. Includes casting and mold making supplies. Art supplies: craft boards (such as foam board), plastics, adhesives, and lots more. Their online store lets you browse by category or search for specific products by name or brand. Artists' accessories, brushes, foam boards, and paints. Online and mail order (printed catalog) of sewing and quilting supplies. Look over things like fusing tape (partially melts when heated), small tools, rotary cutters (useful for foam board and other lightweight laminates), and elastic material. Crafts, including knitting and needlepoint. Use the plastic needlepoint "canvas" for making grilles, bumpers, and other parts for your robot. Local and online stores. Complete line of craft materials and art supplies. Also local stores (predominately in the Midwest and Great Lakes areas of the US). Airbrushes and compressors, general art supplies. Art supplies: adhesives, paints, substrates, crafts, and drafting. Hobby Lobby is not to be confused with Hobby Lobby, International. The former is a chain of arts and crafts stores; the latter is a mail order retailer of hobby R/C components. Hobby Lobby locations can be found throughout the central US. Manufacturer of children's arts and crafts supplies. These include specialty paper, pre-cut Styrofoam pieces, and foam sheets. Michaels sells arts and crafts items, both online and in some stores across the North America and Puerto Rico — they're the largest such retailer, in fact. 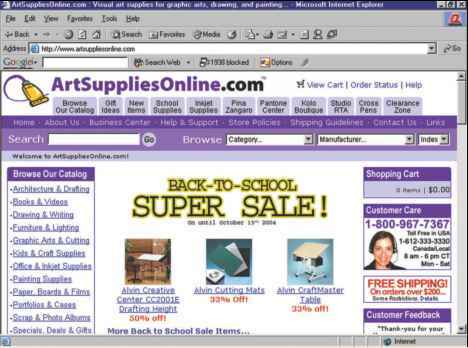 This site bills itself as the, "world's largest online discount art supply store." This seems to be true; they have a lot of stuff — quite a bit of supplies for paint artists, as well as foam core, precision tools, and adhesives. Online and mail order (printed catalog available) of sewing supplies. Let your imagination run wild. eNasco is the online component of NASCO, a mail order catalog offering some 60,000 educational supplies. The company also sells farm and ranch supplies (no kidding), construction toys, and books. Outlet stores are in Fort Atkinson, WI and Modesto, CA. Polymer Clay Express is an online retailer of unusual and useful art supply materials, including plastic shrink art, WireForm wire mesh, casting and modeling clay, Lazertran transfer sheets, and holographic metal foils. Who says robots should look dull! 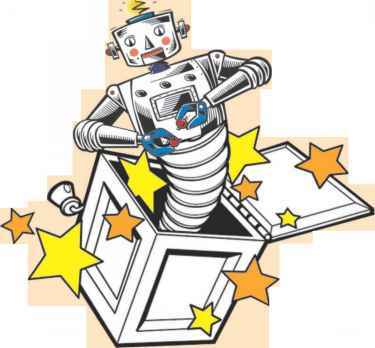 Art supplies, craft kits, tin toys (Futurama), miscellaneous toys that can be hacked apart to make robots. Art and framing supply. Local store and online store. Products include adhesives, airbrushes, crafts supplies, sculpting supplies, and foam board. • Intaglio printing plates include copper or zinc sheet metal. These sheets can be used in the construction or embellishment of robot bodies. Available in different thicknesses (1-2 mm is average) and sizes. The smaller sheets are quite affordable. • Fluorescent acrylics can be used to paint your robot in vivid colors. Bright colors can be used when building robot teams for competitions (depending on vision systems, of course). • Student quality rollers, used to press on glued laminates (thin metal over wood or plastic), rub-on lettering, and in any other job where gentle but firm pressure must be applied. • Engraving plastic is a thin, semi-flexible plastic sheet that can be used for building laminates. Online retail stores that specialize in doll and Teddy bear making parts are listed here. This includes something known as armatures, which are used in dolls and puppets to replicate bone joints. Armatures can be bent to a variety of shapes and act as a kind of skeleton. If the armatures are strong enough — metal or wood, for example — you could use them to fashion the frame for a walking robot. 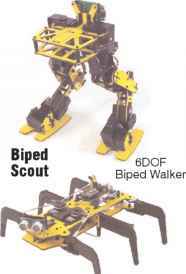 Lighter armatures can be used for less rigorous tasks, like small grippers. Other doll parts you can use in your robots include eyes, noses, and "body foam" (soft and pliable, but thick). These are useful if you are marking an animal- or human-like robot. Some doll parts stores also carry sound modules, a few of which let you record your own voice. Others play a simple tune or make animal sounds. Use these to build "wild-and-wacky wobots." Ball-and-socket doll armatures. Sells individual pieces and kits of parts. Teddy bear supplies: eyes and joints. Teddy bear and doll body parts: eyes, noses, squeakers, whiskers, voice modules. Teddy bear supplies, including disk joints, screw joints, eyes, and noses. Robotics Resources bodies are soft fabric and foam over bendable armature wire. Attach a head and you've got your own Talking Tina! Teddy bear parts, including eyes. Teddy bear supplies, such as eyes and foam. Taxidermists use various artificial body parts to stuff elk, deer, fish, and other game that hunters bag. Of particular interest are eyes, casting materials, foam, and even fake fur. These products are especially useful if you are building an ani-bot — a robot made to look like a cuddly bear, squirrel, or weasel. Expanding foam — available from many taxidermy supply sources — is especially interesting. You spray the foam out of a can; upon contact with air, the foam expands to several times its original volume. Once dry, the foam can be sanded and carved. Uses of expanding foam include making body parts for a larger robot and forming simple molds. Taxidermy supplies: eyes (for humanoid or animal robots) and foam. Stuff for when you bag that ol' robot. McKenzie sells taxidermy supplies, of which things like eyes, casting materials, and carvable foam are noteworthy to the robot constructionist. Check out their carving foam, various kinds of glass eyes, and assorted unusual materials. Their foam block is easy to work with and can be shaped with simple tools. Last, but certainly not least, be sure to check out the wares in these additional sources. They include sporting goods stores, appliance repair outlets, and even farm supplies. Model rocketry stuff. For building supplies: epoxy clay, cardboard tubes, and parachutes (in case you build a hang gliding robot). Keeping the weight down is critical in model rockets. 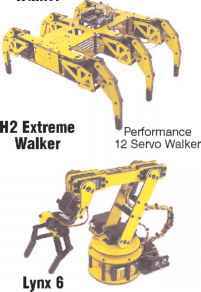 These same products make for ideal lightweight components for small robots. Sporting goods chain store. Use the store locator or search for product information. Look for things like small ping pong balls you can use for caster wheels or nylon fishing line for making actuator cables. Dispel the images of a John Deere robot — this catalog is useful for the non-tractor goodies it offers, such as fasteners, springs, clamps, tubing, PVC, conduit, tools, and lots more. Appliance parts. You'd be surprised what neat things you can find: gears, small DC gearmotors, levers, cranks, cams, belts, and lots more. Study the catalog for inspiration. Another source for replacement appliance parts.